Cape Town - Half-centuries from Aiden Markram and Henry Davids paved the way for the Titans to make it two T20 Challenge wins from two after a thumping 38-run win over the Knights at the Diamond Oval in Kimberley on Wednesday. Both made exactly 50 as the defending champions amassed a venue record of 199 for four – the previous mark being 190 for three set by the Cape Cobras against the Eagles way back in the 2006/07 season. Tabraiz Shamsi took two for 30 as the visitors failed to put up any sort of fight and eventually replied with 161 for seven. Dale Steyn, returning from a lengthy injury lay-off, made a successful comeback to competitive action by collecting one for 25. Overall, though, it was a disappointing end to a match that promised so much after both sides entered the match on the back of victories in the opening round of games at the weekend. 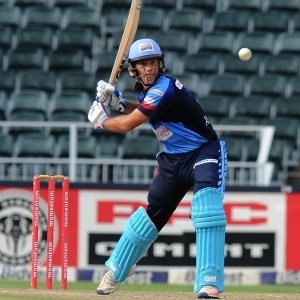 The Titans, who lost the toss and were asked to bat first, started well with veteran Davids, who opened the batting, facing 42 deliveries and striking three sixes and two fours for the 20th T20 half-century of his career, while rising young star Markram faced 34 balls for his fifth career half-ton, which included four fours and a six. The pair were the main contributors, but the fireworks were provided by AB de Villiers and Farhaan Behardien, the latter blitzing 37 off just 14 balls. De Villiers went past 6 000 runs in 20-over cricket, becoming the first South African and 15th man overall to the mark during his innings of 43 from 20 deliveries. Titans captain Albie Morkel (1/10), who became the fifth player from any country to play 300 T20 games, made the initial breakthrough with the wicket of Grant Mokoena (21). Steyn and Shamsi accounted for the two key men in the line-up, dismissing Theunis de Bruyn (22) and David Miller (8) respectively – severely denting the Knights’ prospects. Top-scorer Andries Gous tried his best to change the script, but his 37 failed to hurt the Titans as they claimed another big win.